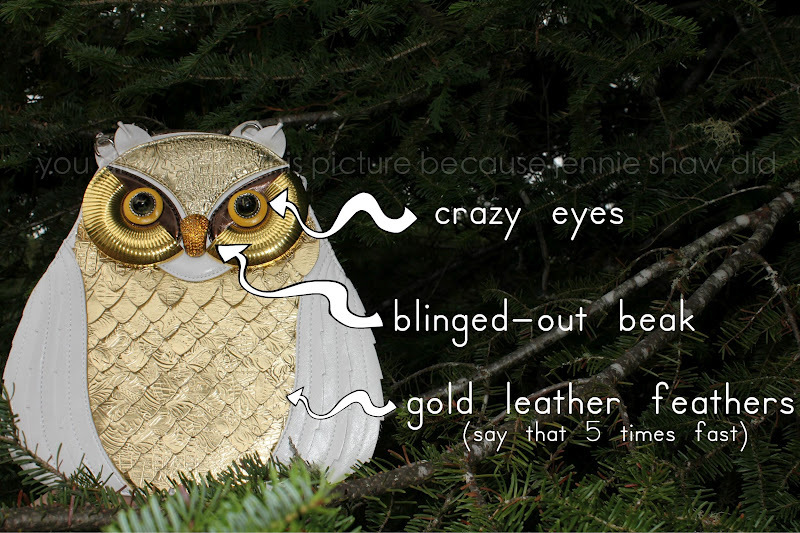 The description states that you should buy the purse because it's a piece of "hoot" couture. Amazing pun aside, I couldn't help but feel sorry for the Out Owl Night Bag. Mostly because it's the b-hoot-leg version of one I found during our Happypants Reunion Tour. Before showing you the magnificence that is my owl handbag, I'll give you the low-down on how she flew into my life. It was POURING rain on Friday morning. We hadn't planned on going shopping because people can sneeze on you and I wanted to make sure I was well enough for the McKLove wedding, but when the heavens opened and shoppers scattered like freaked out Chihuahuas, we spotted an opportunity. We wandered around the deserted streets, popping into whatever stores struck our fancy. The Remix found two pairs of shoes, but nothing really caught my eye. When we got to Misdemeanors Fashion Crimes, a favourite store of mine (side note: I bought my first semi-formal dress there when I was 15. It was made of crushed velvet, had sorcerer sleeves and was effing amazing) I breathed a sigh of relief because it was full of sparkles, sequins and crinoline - just like I remembered. After combing the store, though, all I could find was a gigantic silver ring in the shape of a wolf head. It was a cool ring, but I'd been hoping to get something super-mega-cool. But then I got to the cash and everything changed. "What's that?!" I asked, pointing at a shelf behind the register. "Oh, that's our owl purse," she said casually. "Gimmiegimmiegimmie Can I see it, please?" "Sure," she said and got a small step-ladder. "How many of these did you get in? I love her but don't want to run into anyone else with her. Obviously," I said, stroking the supple leather. *blank stare* "Umm...we only got the one." So she did and then The Remix and I skipped all the way back to Baby Jamie's condo. Okay, so I was the only one skipping. Fine - there was no skipping...externally, that is. On the inside, I was a skippy-mc-skipper-son. Not only is she 12" high, but she's got crazy eyes, a blinged-out beak and gold leather feathers, which basically means that although there's a good chance she'll eat your face, she'll look good doing it. 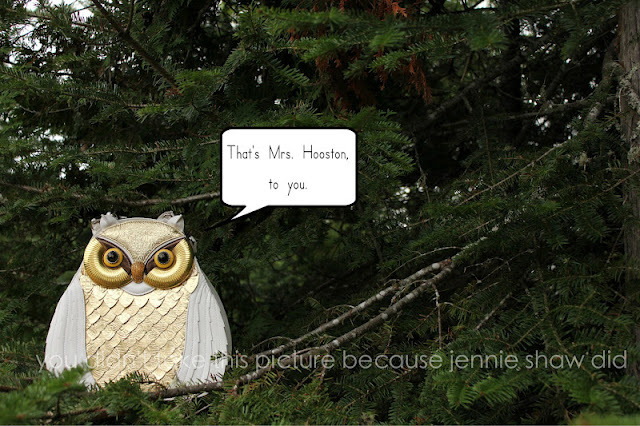 An owl after my own heart, Mrs. Hooston is. So sorry, Modcloth. You know that I love you but this time, you've been bested. I'm the first to comment on this?? It is comedy gold! With sparkles! Obviously. The name is so absolutely perfect for your purse. Clearly, the sales girl had no idea what a treasure she had behind the counter.